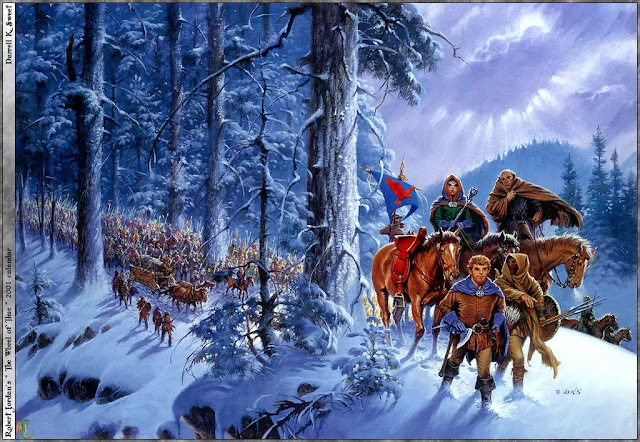 Welcome to my Wheel of Time re-read! This will be the 1st post of many posts to come. Now you may be wondering, "Wait a second Krit, if this is a re-read, why in the world are you starting at Book 9?" Well I'm glad you asked, my good friends! You see, everyone out there is doing a re-read out there right now. Check out Dragonmount.com for a list of some other re-reads that are going on. Well, I'm tired of starting at TEotW. Everyone does that. Recently, I think it was Terez (a notable WoT fan, especially via Twitter/Theoryland.com) that said we've all read TEotW n times, TGH n-1 times, TDR n-2 times, etc. Well. I'm starting most of the way through at Winter's Heart for that reason. So, in the interest of keeping things fresh for myself and my readers, this is what I've decided to do. of Winter's Heart, the colors Blue and Purple come to mind every time. A cover is the 1st impression of a book. So seriously, WTF. Look at that! Apparently this book is about people wandering in the snow aimlessly. Mini-Perrin, an Aiel, is that Moiraine?, and a gigantic and/or floating monk (cause he sure isn't riding that horse) do... stuff... with an army... maybe? Which I guess isn't too far off from what happens. But I was led to believe here that this book's main conflict would at least center around Perrin, which was good. I hadn't heard too much from him and was therefore excited. Well, it gets started and I'm not disappointed. His plot isn't the PLOT LINE OF DOOOOM (as Leigh refers to it on the Tor.com re-read) to me because I thought this was a really great plot. I was interested in it and it was tense! The book starts and I'm fooled into thinking that that is true. Well after the first 6 chapters.... pfft, we hear no more. That's not even a cliffhanger. That's just the cover not showing the main conflict of this book. Anything with Mat/Tuon or Rand would have been much more appropriate here. Hey look! Blue and Red! Colors are still the same-ish! Yay! People will say, "SPOILER! This can't be a cover cause it gives away the ending!" I say... "How?" If I've never read the book, Rand is doing something with the power... and? so? what is it? Looks important though. It's an attractive cover though and makes me curious as to what Rand is going to do. Makes the ending something to look forward to. Anyway, lets get to the re-reading. Well. The title gets its name here. The seals that hold back the night shall weaken, and in the heart of winter shall winter’s heart be born amid the wailing of lamentation and the gnashing of teeth, for winter’s heart shall ride a black horse, and the name of it is Death. I love the snippets we get from prophecy. It makes the books feel really neat. It also gives us insight into what is actually going on from a scholarly, or rather, a historical perspective. We often see this as prophecy, but I like to think of it as history. We know the seals are weakening. We know that the world is having a horrible winter. 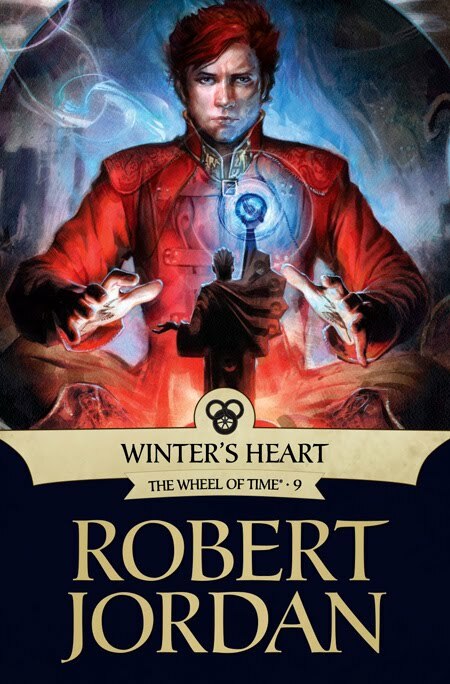 But we learn here that Rand takes another turn for the worse, to the point of being known as Winter's Heart. He even calls himself that a few times, which it quite telling. We see too much into his head at times and makes us sympathize with him too much. From everyone else's perspective (except, you know, his 3 lovers) he is cold. Seaine Herimon: We see right away Rand's effect on the world. He shall ride a black horse named Death thing. The land is one with the Dragon. As such the pattern begins to fail and deteriorate as Rand's sanity does. Seaine notices rats. There have never been rats in Tar Valon. It begins. I really REALLY loved that there was this secret underground group of folks sticking it to the Black Ajah. It showed that while Aes Sedai tend to be cliquish and annoying a lot of the time, when it comes down to it... they get s#!t done. We don't know what most are doing, but I think all of them have some project they are working on the is pretty important and we just have no idea what is going on. I think that is really hard to get into Seaine's mind here though. We've known definitively about the Black Ajah for a very long time, but to her it is a myth and an abomination. It is like the Priest/Bishop/Cardinal/Rabbi/whateverallotherreligionshavethatisequaltothis/ who in reality has sworn their soul to the Devil! How is that even possible? It is one thing to be a bad person and do bad things, but to have actually sworn to the BA is just... just... unimaginable. So when Talene finally caves and reswears her Oaths (thereby invalidating her BA oaths, so as to be able to speak about it... I wonder if this would have worked on Verin. Poor sneaky Verin...) it is earth shattering for all who are there. If a priest molests a little boy, we know he is a bad person, someone not worthy of the title and scum. But we never think they have sworn their souls to the devil. Elayne: Fraking Warders. Why in the world do we have to hear about how this bond acts as microphone feedback getting louder and louder till it is just a high pitch noise that annoys everyone? Cause that is what is happening. I'm annoyed. I like my characters to have their own emotions and own reaction. This halfway makes them the same person. Plus, it de-coolifies Birgitte. Plus she gets all complainy. She always seemed like Female Mat to me. Complain, but do it. Here she just comes off as whiney though. She has turned into Miss Grumpy-Grump. Grr. And no, I don't want to know her "courses have shifted by more than a week to match the other woman's." Ew. In 9 books... this is how we learn women actually have "courses?" We never even see or hear anything, ever, about an out house, but we jump to this. Gah. Oh, but Dyelin. One of the unique politicians in WoT that a) I remembered who she was after my first read of the series b) is really competent as a person c) refreshingly honest. If no Elayne, yeah, Dyelin totally should have been Queen. Which is, I guess, why it makes sense as to why Elayne doesn't fully trust her yet. That being laid out there makes all the politiking a lot more comprehensible to me. Remember eventually Arymilla puts a claim to the throne and Arawn and Sarand always support her. The other houses eventually switch sides. I'm not going to say anything more about that... but I'm going to refer back to this whenever I read about the succession. Sea Folk, blah. Mazrim Taim, blah. I love how Nadere makes the summons at the perfect time to have everyone imaginable in the room when making the summons. Makes me wonder if she was just waiting outside the room, eavesdropping, for the perfect moment. Makes me smile when I picture her with her ear to the door. Taim sees Elayne in her birthday suit before Rand, that's just not fair. I really like the becoming sisters ceremony. I've gotta admit, it's pretty intense. I really liked the tell your favorite or worst thing part too. It's something that best of best of friends, or first-sisters would know and do. Anyway. The whole actually feeling like being birthed thing from Amys was just neat. I think it is done in such a way that doesn't feel disgusting, over the top, or whatever. It feels very symbolic and touching... other than the large amount of other women watching the whole thing, but still. Great scene. Well, the Black Tower is getting pretty huge now. I don't like the bond that Logain used. It's just wrong. But for some reason I can't find myself disliking Logain. I don't know why though. He's never done anything to earn my trust: Then again he's never done anything to lose my trust, so maybe that is why. Plus, we saw him in TEotW imprisoned and awesome. We saw him lose his will for the most part and mope around the White Tower, and we saw that restored by Nynaeve. So I feel like we've been through a lot together. It's like we are facebook friends. We never hang out, but I know enough about him that I check on his status updates every once in a while... I demand a view point! Well, we also learn that Logain is at odds with Taim. So there's that for + points too. When I heard about Taim's "private lessons" my hackles immediately rose. I think this is when the 13 x 13 trick of turning to the dark first began. Taim may have needed to find some original recruits, but I don't believe for one moment that THAT many Darkfriends, all able to channel, exist in the world. Or that Taim was able to manipulate folks to his dark causes... that just wouldn't happen. It has to be by force that so many are being turned. We don't see people really talking about the bigger signs of this until ToM, but I still think that it is happening. Rand: Hooray for the 1st obscure update to Rand's Big Plan! "Kill Dashiva and Co., Cleanse the Source!" I like how he isn't really sure how its going to go down yet, but gall dern it, he's going to try. we see Rand has been hoping all over the place (and Rhuidean for the Ter'angreal of doom) which is basically what we see Rand doing for the rest of the book. We will see viewpoints and updates from around the world, then short Rand update. Then more stuff, then short update. Just enough clues. This is why this book is great. It builds up to the Big A$$ Ending we all hope for which LoC, ACoS, and TPoD didn't really do. IMO. I liked Rand watching the steam wagon. His reaction was super cool. Especially remembering the first time he came to the school and saw the origins of it. Hoorah for Steampunk in the 4th Age. I love how Rand just desperately wants to leave something good behind. He just hopes and prays and wants to do something good. Rand is an alright guy, you know that? Ooo. Moridin face flash! I can't wait to see how this turns out. Dobraine: That guy is like the Cairhienian Dyelin. He's just cool and honest and, well, an all around good guy. Hooray for being the Steward of Tear. And I'm spent. Long Prologue. Till next time. Just a word on the "courses" and how that seemed to repulse you, especially as you say there were no mentions of anything like outhouses prior to this... There were LOTS of mentions of outhouses before this... That's what "privies" are! The fact that we got this far in a series featuring so many women trsvelling around the globe without a mention of their periods actually seemed odd to me (especially in light of all the references to bathroom stuff) so this was actually kind of a relief to me.